The server that I have been running is based on the CraftBukkit project. This project fills a gap in the Minecraft ecosystem: it provides an API for modifications, which is something the stock server does not do. It is usually a version or two behind the current release, which is fine for me and my users. I recently decided to upgrade the server I run, and upon checking the download site, I found a DMCA takedown notice. My first thought was that Microsoft had filed the request, since they had purchased Minecraft, and CraftBukkit had always been in a strange place legally. I had never heard of Wesley Wolfe before, and I was reasonably sure that he did not have the rights to the project; so I began to research what had happened. The date on the takedown is the 3rd of September, so I was late to the party - but that also meant that there was a lot of analysis already done, and I just had to find it. I went down several wrong paths before arriving at a conclusion which made sense; but first, a bit of backstory. 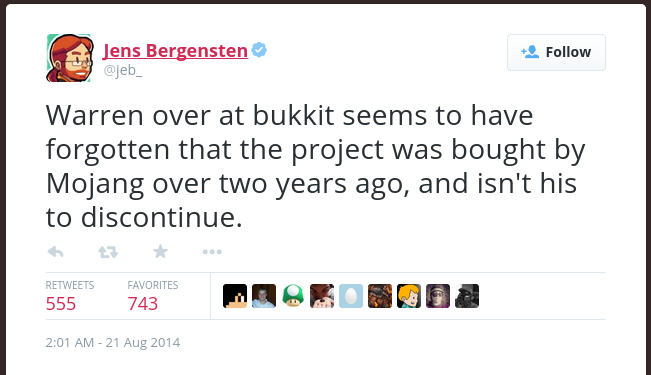 CraftBukkit has been around for almost as long as Minecraft. It has always been in legal limbo since it contains decompiled and edited portions of the official server code, to which none of the project's developers has rights (as far as I know they are held by Mojang). Several months ago the Mojang company suggested that it would adjust Minecraft's EULA in order to crack down on servers which charge for better gameplay - Mojang interprets this as charging money for their game. ...it seems that Mojang can determine what is a mod, plugin or hack of their game on the fly and their recent abrupt turn-around on enforcing the EULA has us understandably worried. Couple this with the fact that it isn't legally viable or acceptable to enforce the EULA piecemeal and our future is clear. So he announced the end of the CraftBukkit project. And then out of the blue Mojang announces that it owns CraftBukkit, having purchased it several years previous and just not told anyone (remember here that CraftBukkit is under the GPLv3). So then the obvious question is: what the heck happened? Can you end a GPL project? Couldn't someone else fork it and continue it? Can you buy/sell a GPL project? What is actually changing hands? And then on September 3rd one of the CraftBukkit devs realizes he's holding the fuse, so he went ahead and lit it. I'd imagine the point of his action was not to make CraftBukkit unavailable (at least, I hope that's the case - it's now three months later and I can't figure out what his objective was). But he can legally make a copyright claim on this project. The important part here is that he retains the copyright to his code; it is not transferred to the project and then licensed. He licenses his code to the project under the GPLv3, which stipulates that it cannot be used in a project that is under a more restrictive license (and also maintains that stipulation). His claim rests on the issue of whether or not the decompiled and edited portions of the official server code are licensed properly - this would make CraftBukkit's license invalid, and in turn, their use of his code.